Mario Kart 8 currently inhabits many homes and fills them with glee and cursing. Why not add to that by having some Animal Crossing-themed DLC? 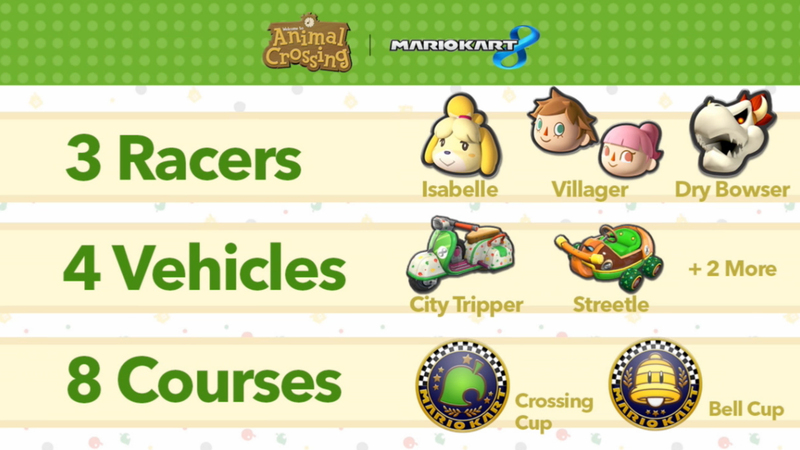 The upcoming DLC, which will be available on April 23rd, 2015 for $7.99 will add three new racers, four new vehicles, and eight new courses including an Animal Crossing course that will randomize the seasons every time you play! The three new racers include the New Leaf mayor’s assistant, Isabelle, male/female Villager, and Dry Bones Bowser. On top of that, a new 200cc speed class has been announced! For the longest time, 150cc has been the highest threshold for difficulty in Mario Kart, but 200cc will really test your skill. This free update for the game will challenge players to understand the game’s mechanics like never before.